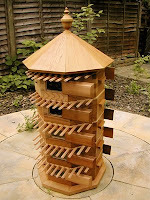 > Bespoke Period Beehives now available! 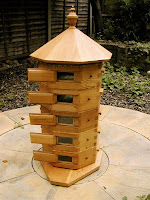 Now in its 5th year Custom Timber Build are makers of bespoke period beehives. They specialise in reproduction period beehives, but are happy to quote to build a beehive from your own personal drawings. Some of the beehives built for clients are the Stewarton Hive. Invented in 1819 the Stewarton possed a unique management system. 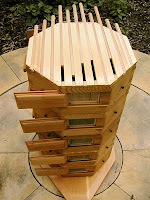 Movement of bees in the hive was controlled by beech slides set between the top bars of each box. With the centre most slide left in to create a solid roof to the brood area. The queen was inhibited from moving into the honey supers. The outer sides were withdrawn during a nectar flow forcing the bees to draw comb from the sides inwards.